Most real-world negotiation involves multiple interdependent issues, which makes an agent’s utility functions complex. Traditional negotiation mechanisms, which were designed for linear utilities, do not fare well in nonlinear contexts. One of the main challenges in developing effective nonlinear negotiation protocols is scalability; it can be extremely difficult to find high-quality solutions when there are many issues, due to computational intractability. 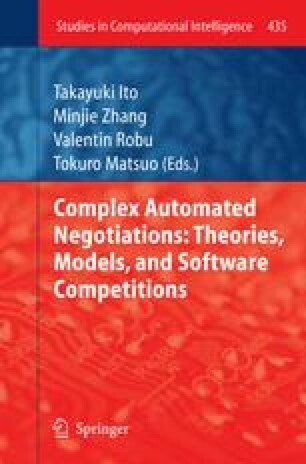 One reasonable approach to reducing computational cost, while maintaining good quality outcomes, is to decompose the contract space into several largely independent sub-spaces. In this paper, we propose a method for decomposing a contract space into subspaces based on the agent’s utility functions. A mediator finds sub-contracts in each sub-space based on votes from the agents, and combines the sub-contracts to produce the final agreement.We demonstrate, experimentally, that our protocol allows high-optimality outcomes with greater scalability than previous efforts. Any voting scheme introduces the potential for strategic non-truthful voting by the agents, and our method is no exception. For example, one of the agents may always vote truthfully, while the other exaggerates so that its votes are always “strong.” It has been shown that this biases the negotiation outcomes to favor the exaggerator, at the cost of reduced social welfare. We employ the limitation of strong votes to the method of decomposing the contract space into several largely independent sub-spaces. We investigate whether and how this approach can be applied to the method of decomposing a contract space. 3.Sloan School of ManagementMassachusetts Institute of TechnologyCambridgeU.S.A.